When we finally figured out which fork was Mind Bender and descended it in March 2004, we found it a disappointment; nice enough, and certainly with pretty sections, but neither long nor challenging by our standards. The 'difficult' anchor for the last rap proved to be easy to set up. The geometry is advantageous, and plenty of igneous rocks of the right size are around. Though the final rappel is LONG, building a solid anchor for it is straightforward. Mind Bender, also known as Little Middle Fork of Robbers Roost Canyon, makes for a nice walk in a beautiful landscape with good friends – with some minor technical challenges. The Moki Step exit may be the most challenging part of this adventure. The exit faces north and is low-down, so it can be snowy and impassable in winter, even long after storms. Soft sandstone like this is weak and breakable when saturated with water - exercise extreme caution. A safer exit can be made out White Roost or “The Crack”, but both would require a loooong walk back to the car. 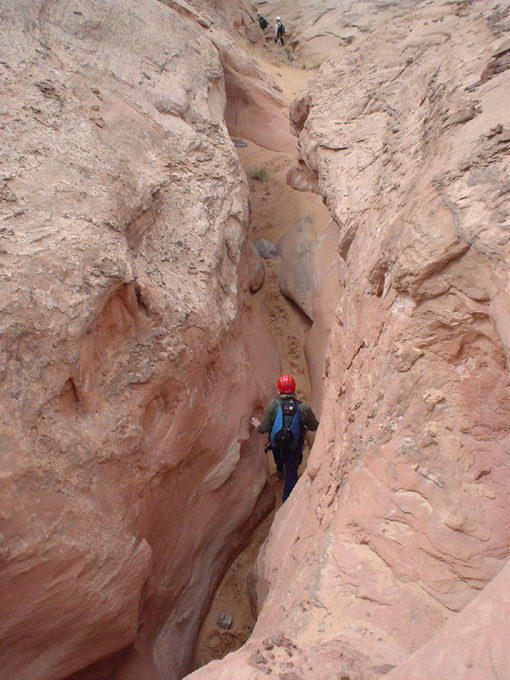 This is a ‘natural’ anchor canyon, and deadman anchors for the rappels are straightforward to build. Requires car spot to save one hour of walking. 2WD needed on dirt roads. Drybags for your gear; after storms, ther can be some pools with water. Some fairly easy downclimbs; might have to build deadman anchors; moki step exit is hard the first time, and hazardous when wet. As with most Roost journeys, getting there can be quite an adventure. Mind Bender is accessed from the mesa top peninsula between the numerous North Forks and the Middle Fork of Robbers Roost Canyon. From Highway 24, drive 24.2 miles to the BIG TEE. Turn south (right) towards Hans Flat, and follow the road 7.1 miles to the LITTLE Y. Take the right fork toward Ekker Ranch, then IMMEDIATELY right on the smaller Burr Pass Road. Follow this road 4.5 miles to the "Top of the Hill" and an expansive view. (This road sometimes has short sections of dune sand on the road - possible trouble for 2WD cars). Follow the road down the slope (a few rough spots), going right at a fork, 2.3 miles to a parking area. This is the 'top' trailhead for Not Mindbender Canyon. Continue west 1.0 mile to a small, ill-defined carpark - this is the two-car 'top' trailhead for Mend Bender. Park here. If you have but one vehicle, or plan on spotting a car, continue west on the road for 0.6 miles to a drill hole and larger parking area, one of the better camping spots in the area (when the wind is not blowing). Mind Bender can also be started from here (Alternate Approach). Continue on the road, passing a good campsite with an excellent view on the right, to the end of the road, 1.2 miles from the Drill Hole Campsite. This is the 'bottom trailhead" - spot a car here (or, with one car, park here and walk 1.2 miles back to the Drill Hole). ...the Mind Bender Fork drainage approach. From the carpark, head north away from the road and, in a few minutes, come to a low-angle slickrock slope dropping into a canyon. You found it! Descend into the drainage, then follow it downhill to the left. About 20 minutes from the car, the first little slickrock narrows appears. Pad-up for the tussle ahead. From the Drill Hole Campsite, hike north away from the road and soon come to the edge of a canyon. Follow the edge right about 10 minutes, then descend steeply down the crest of a slickrock rib to near the canyon bottom. Find a ledge that traverses right above the bottom narrows to the open area in clear view up-canyon, to the northeast. You are now at the first little slickrock narrows, about 15 minutes from the road. Pad-up for the tussle ahead. The canyon offers a few nice little narrows sections. In about 20 minutes, it slots up pretty good and the first rap (40 feet, 12 meters) from a rock in the streambed is made. In another 20 minutes, the second rap (20 feet, 6 meters) is executed. A couple fun, easy downclimbs leads to a drop that at first looks big! - but turns out to be a short drop to a ledge, easily spotted from below. Send the first person down using a meat anchor, or there may be an anchor in place. From the ledge, downclimb easily on the left, avoiding the pool. Some easy walking and the occasional downclimb leads to the final section in about half an hour. A few easy potholes lead to a larger pothole requiring a 10' rappel or handline. If rocks are needed for the last rap anchor (30 feet beyond), they will need to be passed past this pothole drop. Plan ahead. The geometry is fortuitous for constructing a 'natural-ish' deadman anchor for the final rappel, quite spectacular at 155 feet (47 meters). Swagger downcanyon, enjoying the beautiful walls. The canyon opens up when Not Mindbender comes in on the right. Trails can be found here and there that allow avoiding the brushiest sections. The "moki step" exit is about an hour and a half downcanyon from the junction, on the left, and somewhat difficult to find the first time. This exit faces north and is low-down, so it can be snowy and impassable in winter, even long after storms. Soft sandstone like this is weak and breakable when saturated with water; exercise extreme caution. 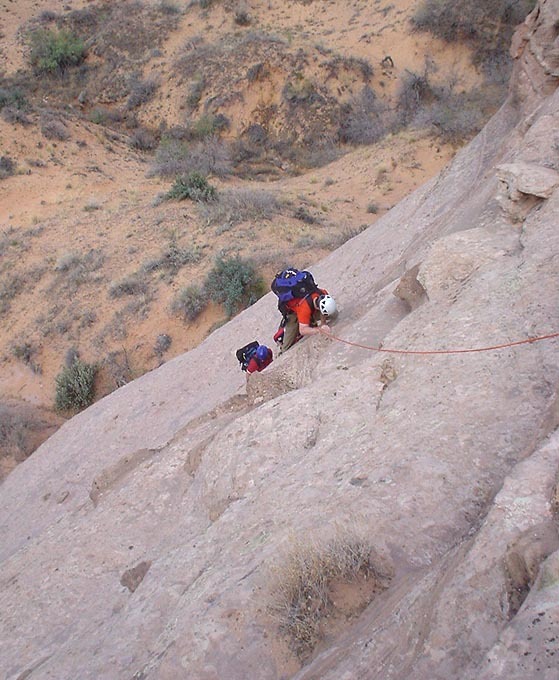 The "moki step" exit ascends a steep wall using huecos and chipped holds, following a route perhaps used by the Anasazi. From the top of the wall, it follows a ledge left over the top of a deeply-cut alcove to a steep slickrock gully. From the canyon bottom, the short wall looks unlikely. 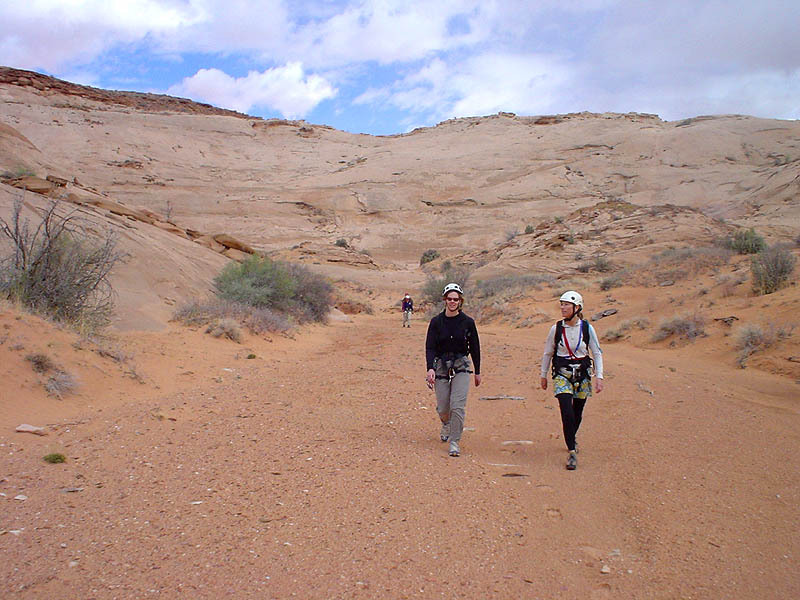 Find a trail that crosses the marshy/brushy main-canyon bottom to the sandy bench above, on which trails can be seen. Follow the trails to the high point of the sand, allowing easy access to the first part of the wall, an easy slab. Climb up and a bit left to the large huecos, then up through the huecos, stepping right near the top. At the top of the steep wall, the angle eases. Continue to the top of the wall. Technical Notes: chipped holds are considered in poor taste. Please do not chip holds. The climb is balancy and much easier without a pack on. We usually have the strongest climber (without a pack) ascend trailing a rope, and provide a belay for everyone else (wearing a pack). I find it easiest for the leader to pull their pack up from the top of the steep wall. There is no real anchor at the top – find a solid sitting stance and keep the rope snug. Traverse left. There are petroglyphs under the overhang above. Cross left above the alcove on a ledge. Ascend the slickrock, then head slightly left and then right over the top of the pass close to the main rock mass. Pick your way up the slope to the top and (hopefully) your vehicle. I descended Mind Bender in March 2004 with Shane Burrows, Alicia Scotter, Tom and Sharon Talboys, Julie and Giles Wallace, and Barb and Jeff Meierhoff; using beta from the new Kelsey book. Next time down might have been November 2008 with Dave Buckingham. On that trip we removed two un-necessary bolts at the last rappel. My first visit to Mind Bender, in March 2004, was rather disappointing. A nice social canyon, but it really had none of the meat SA described - kinda a dud, actually. Rather confusing really. I thought I had found the famous "Mindbender" Fork, about which Steve Allen tells an interesting story, perhaps over-dramatized; but it was not to be - what I found was a really good fork I now call Not-Mindbender. 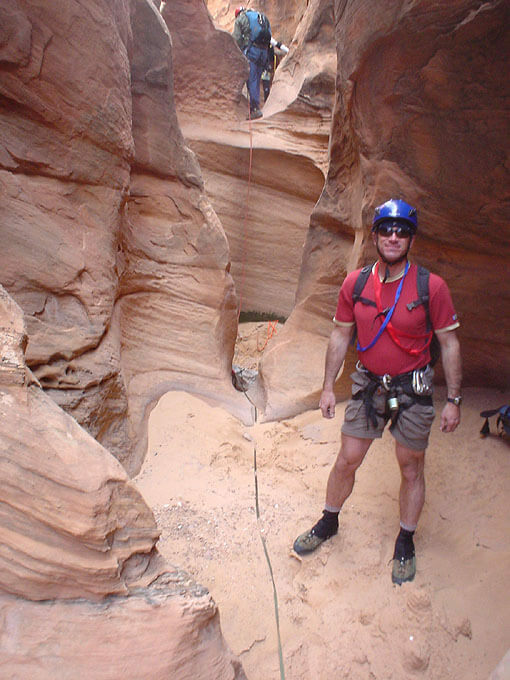 Canyoneering 2 by Steve Allen, pg 50-52 "By the time we reached the crux section of the canyon, we had been enveloped by a blizzard; the snow that whipped through the canyon stung our eyes and froze our hands. The crux was truly a mind bender; the narrow slot gave way to an abrupt drop over the 155-foot-high mouth of a huge cave. We spent an hour rigging our ropes. With no secure anchor points, we ended up burying a sling under a pile of rocks at the bottom of a large pothole and attaching the rope to it. "I went first, carefully sliding out of the slot and into a vertical void, the floor of the canyon invisible in the swirl of snow. Would the rope be long enough? The question was answered when I was halfway down: the rope was long enough but my trajectory would have taken me through the limbs of an oak tree and into a large pool. Not good! With some gentle swinging I managed to hit a dry landing zone. Ginger took her time lowering packs over the fifteen-story drop. From below I saw that the brunt of the storm had descended on her. The rock was now plastered with rime ice and, perilously perched on the edge of the abyss, every move on her part had to be carefully executed. A mistake could have meant the ultimate splat. At long last I saw Ginger's legs emerge from the slot; she slowly spun down the rope, afraid a sudden jerk would dislodge it from its precarious anchor. There were no further obstacles below. The Mind Bender Fork was a done deal."